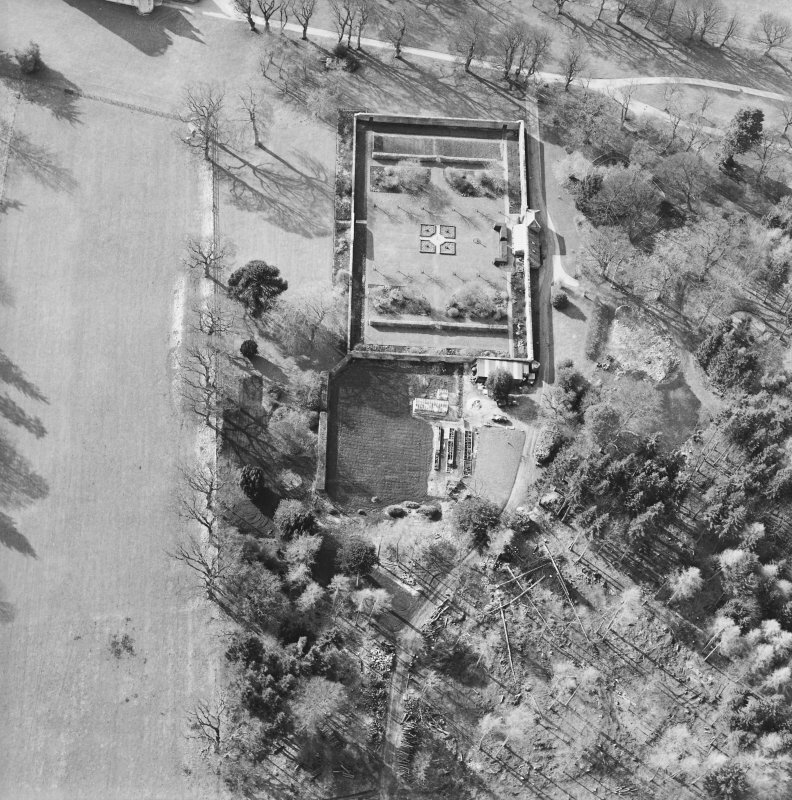 Oblique aerial view of the walled garden, taken from the ENE. 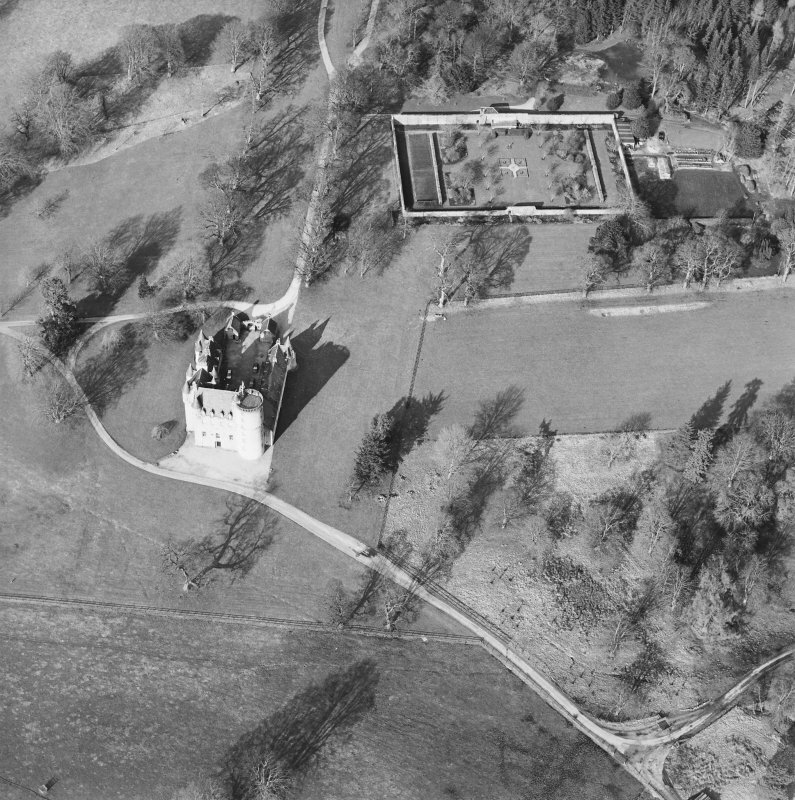 Oblique aerial view of the tower-house with walled garden adjacent, taken from the SW.
Oblique aerial view of the tower-house with walled garden adjacent, taken from the N.
Oblique aerial view centred on the castle with the walled garden adjacent, taken from the S.
Oblique aerial view of the tower-house with walled garden adjacent, taken from the NW. 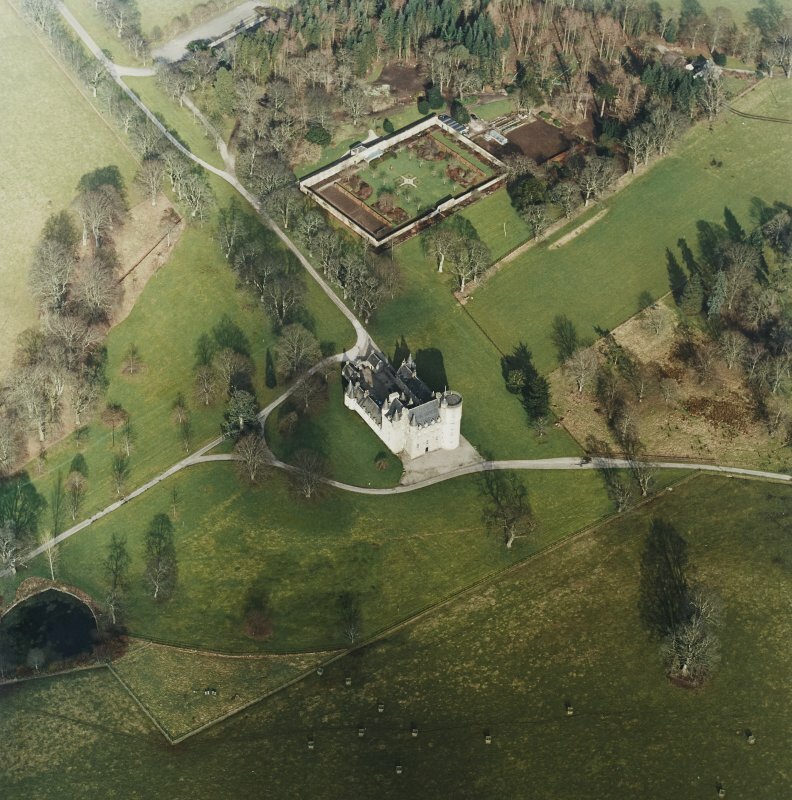 Oblique aerial view of the tower-house with walled garden adjacent, taken from the SSE. 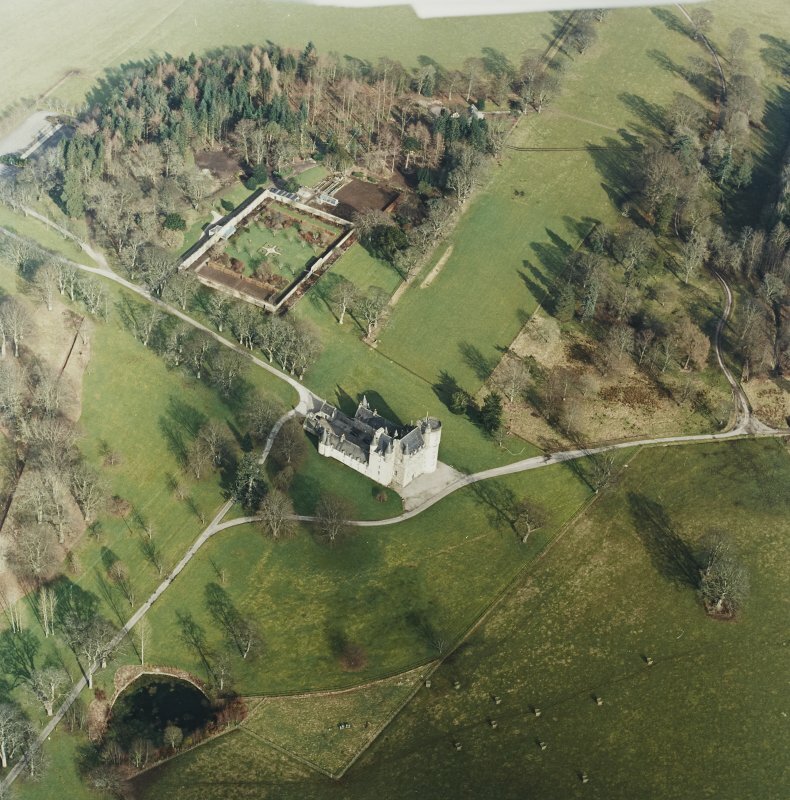 Oblique aerial view centred on the castle with the walled garden adjacent, taken from the SSW. 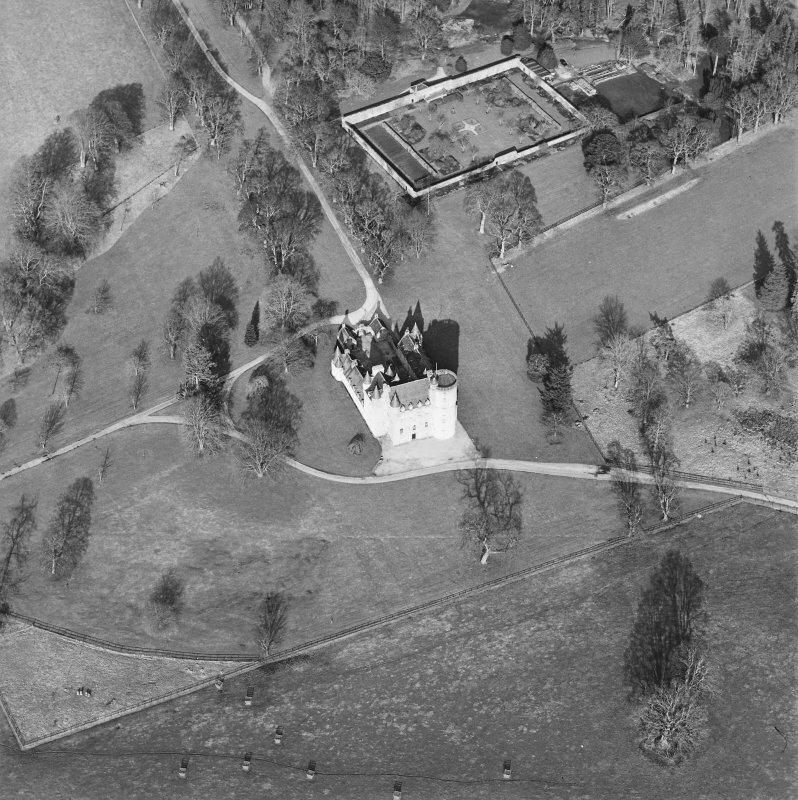 Oblique aerial view of the tower-house with walled garden adjacent, taken from the NNE. 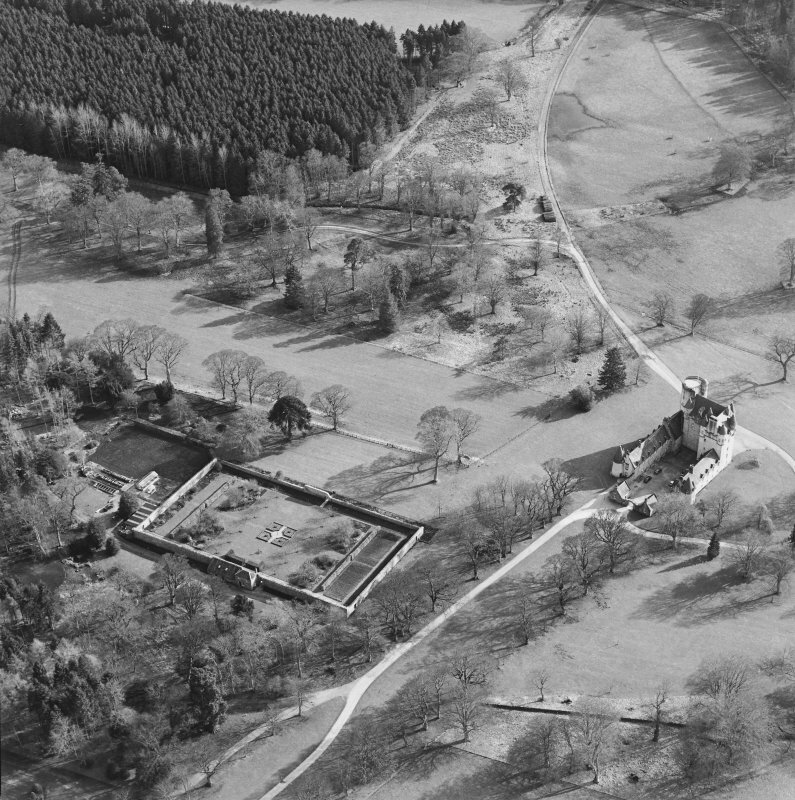 Oblique aerial view of the tower-house with walled garden adjacent, taken from the SSW. 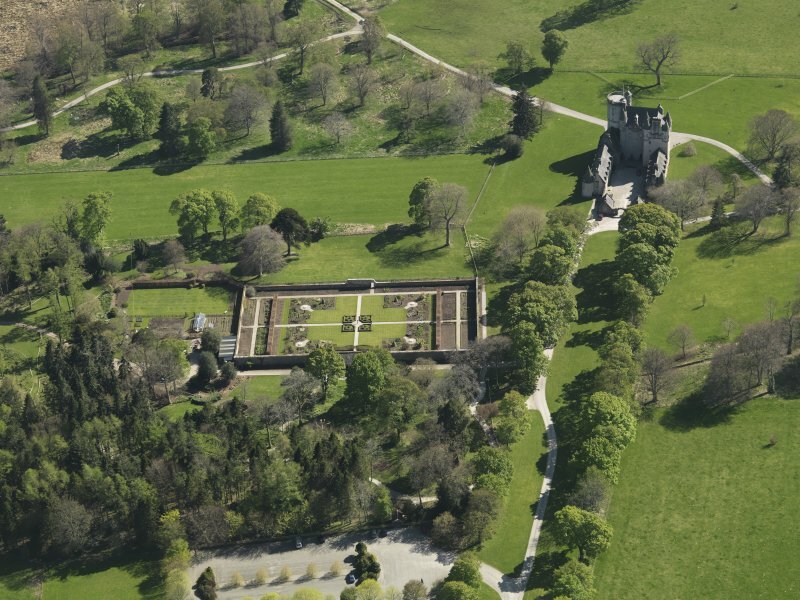 Oblique aerial view centred on the walled garden, taken from the ENE. 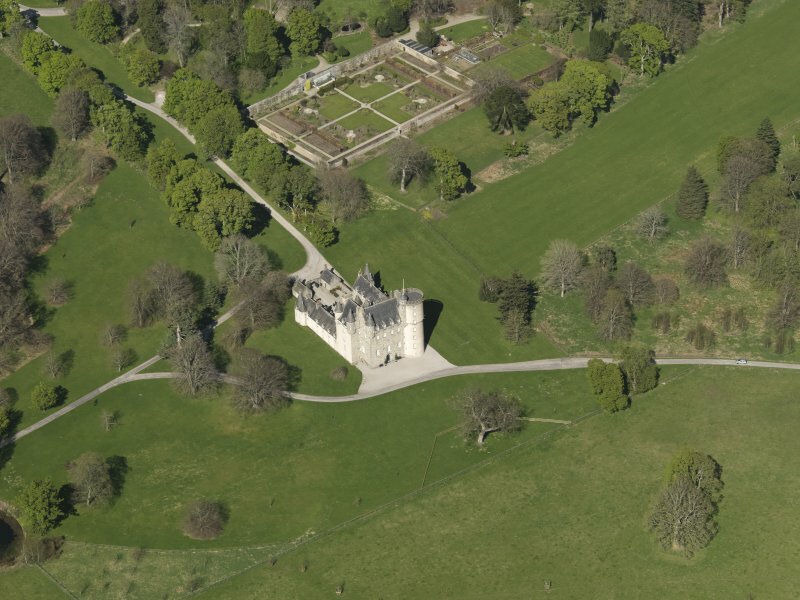 Oblique aerial view centred on the castle with the walled garden adjacent, taken from the WSW. 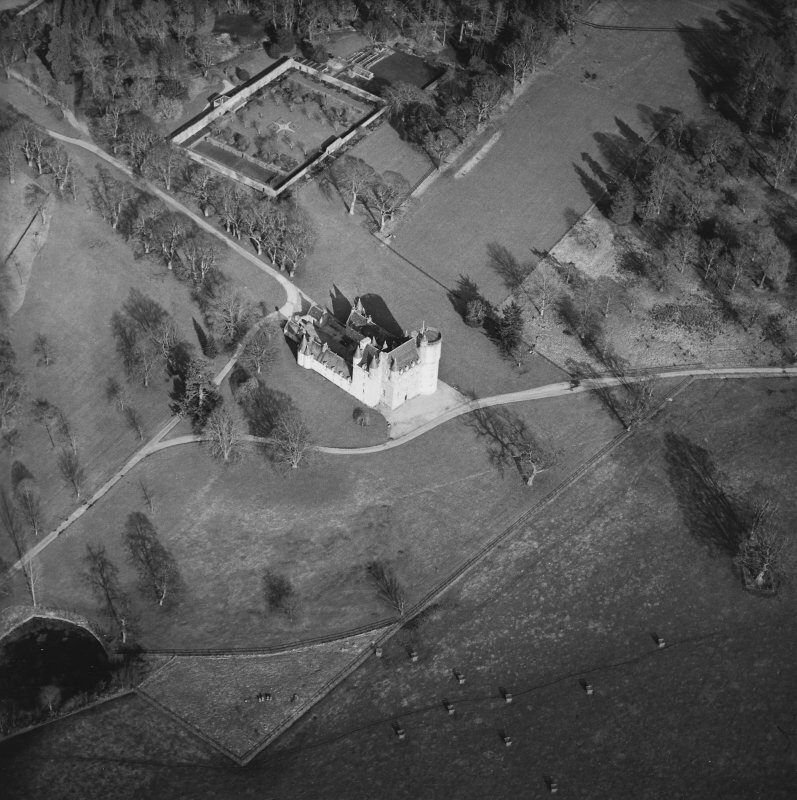 Oblique aerial view centred on the castle with the walled garden adjacent, taken from the SW.
Oblique aerial view of the tower-house with walled garden adjacent, taken from the S.
Oblique aerial view centred on the castle with the walled garden adjacent, taken from the SSE. 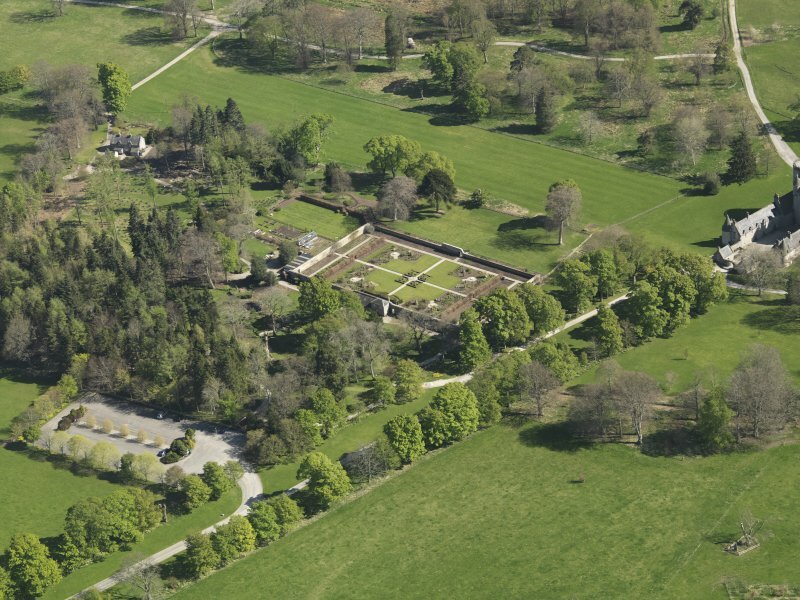 Oblique aerial view centred on the walled garden, taken from the NNW. 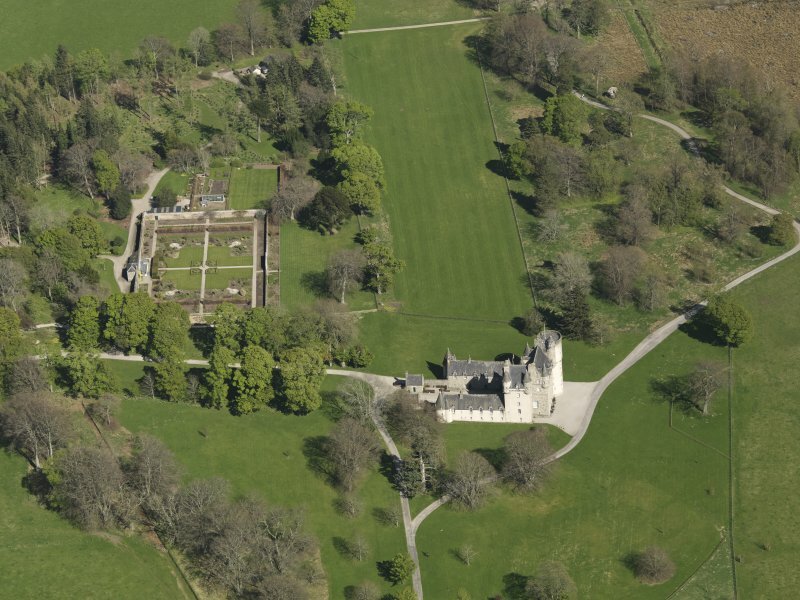 Oblique aerial view centred on the walled garden with the castle adjacent, taken from the ENE. 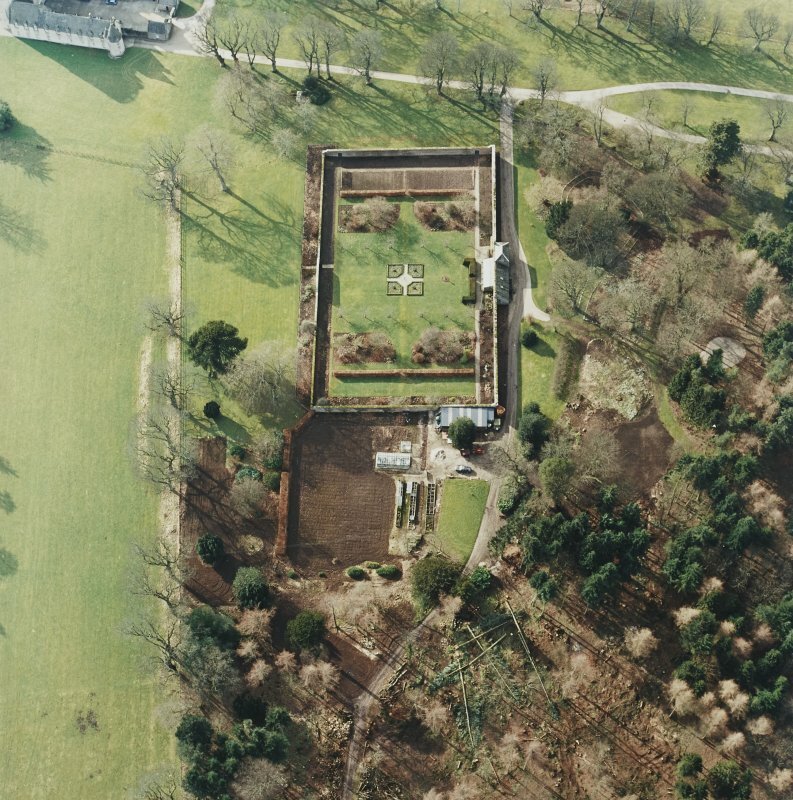 Rectangular walled garden, probably contemporary, contains 17th-century sundial with complex lectern dial in freestone. NJ 723 127 In order to inform a garden restoration project in which much of the original path system of the walled garden is to be restored, a small trench was excavated in October 2003 across the line of a former path. 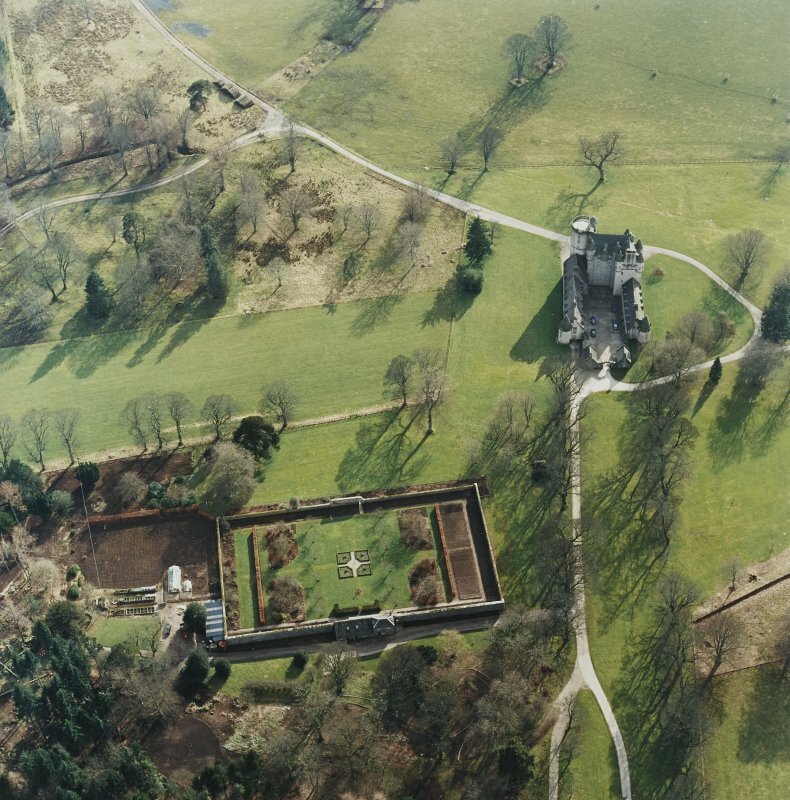 This was once the eastern arm of a centrally planned cross pattern, now grassed over, which first appears on a plan of the garden in 1816 and most likely dates to its inception in about 1794-9. The central cross appears to have been removed in the 1960s/early 1970s. The excavation revealed a series of path surface layers immediately below the turf and topsoil, forming a deposit ranging from 8-18cm in depth and about 130-140cm across. 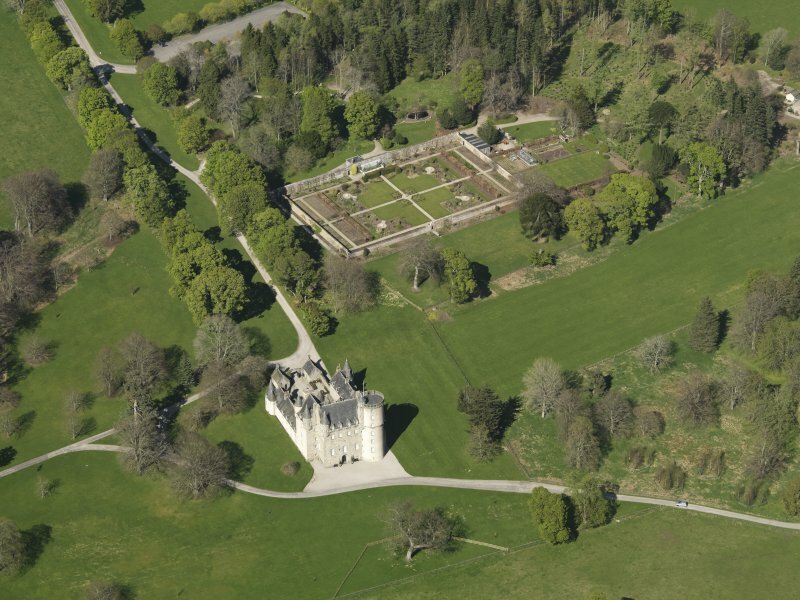 Each surface was composed of the same loamy sand, very similar to the natural subsoil and most probably from a source on the Castle Fraser Estate. The original path surface lay directly over the pre-garden ploughsoil, with no base layer of coarser material or metalling. Archive to be deposited in NTS SMR. B005 Walled Garden (Listed Cat. A) and Bothies, Toilets, Glasshouse. 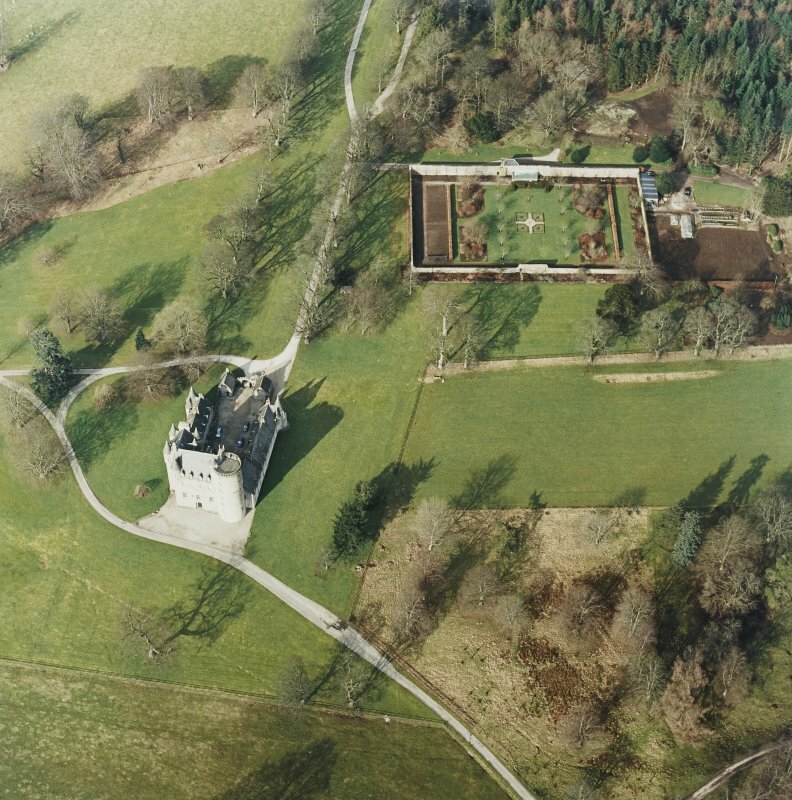 The Walled Garden is contained by a wall of red brick with a stone flag cope and measures 83m x 50m. The wall is generally approx. 3.6m high but with higher sections in the centre of the north and south walls. The high section in the inside of north wall is of granite reflecting the material used for the bothies on the outside of the wall. The whole external north wall is granite faced. Doorways are present in each wall, of which the north and south are used for public access. The east door gives access to a potting shed on the outside of the wall. The west wall has two doors, the lower of which is closed and the upper used for public access and maintenance. • small glasshouses on the south sides of both the north wall and south wall, with buildings on the outside of the north wall. 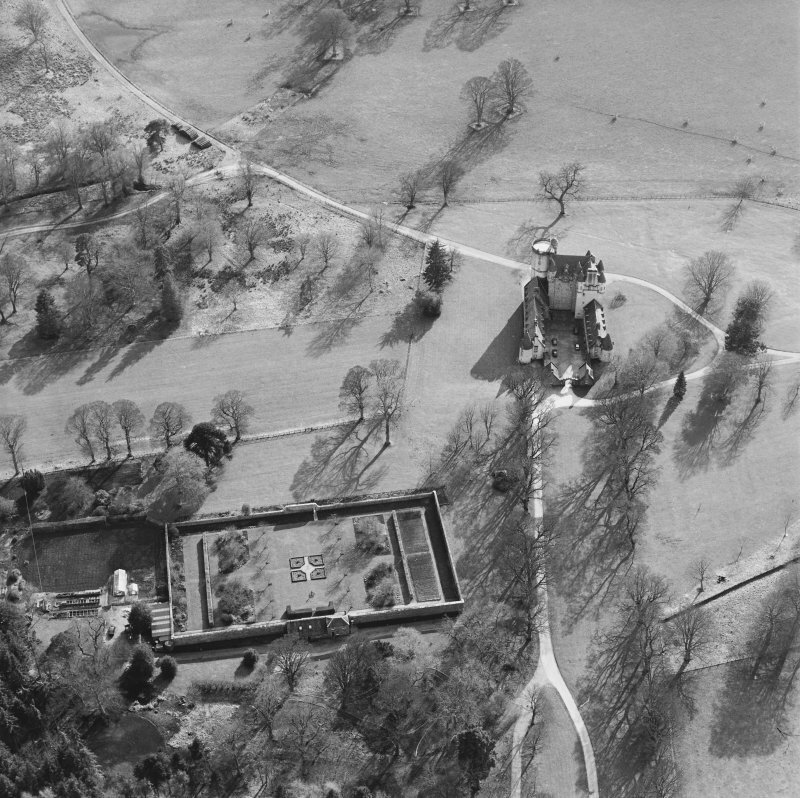 The Home Farm plan shows the central quarters well stocked with small trees and annotates the general area as Kitchen Garden, Orchard and Shrubberies. 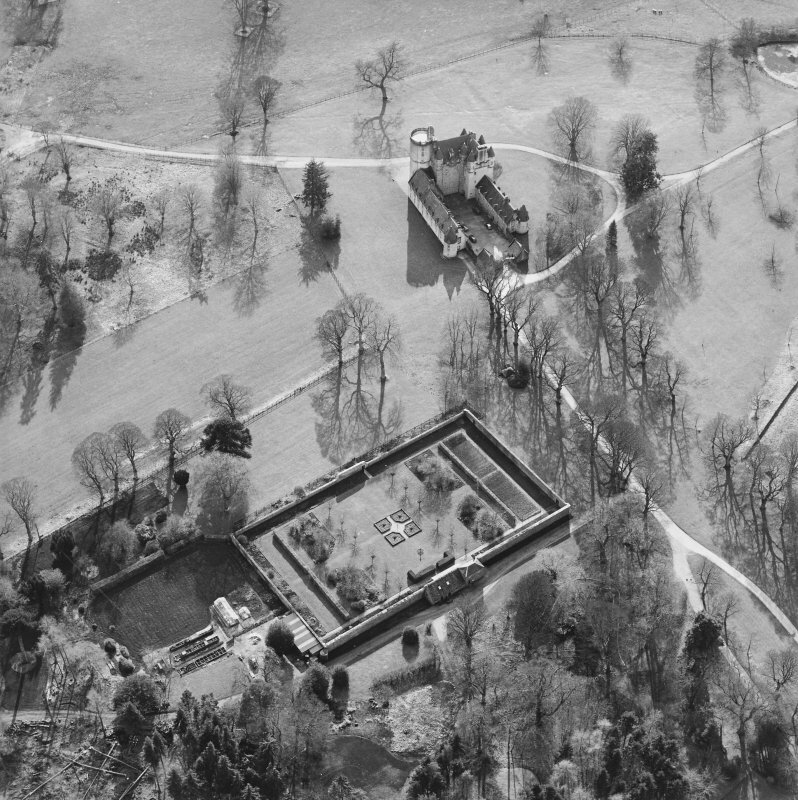 Trees on this plan are very stylised and similar throughout the estate but an enclosure with small trees and shrubs is shown on the outside of the Walled Garden on the east side. To the north a 1.261 acre nursery is shown, south of the present car park. 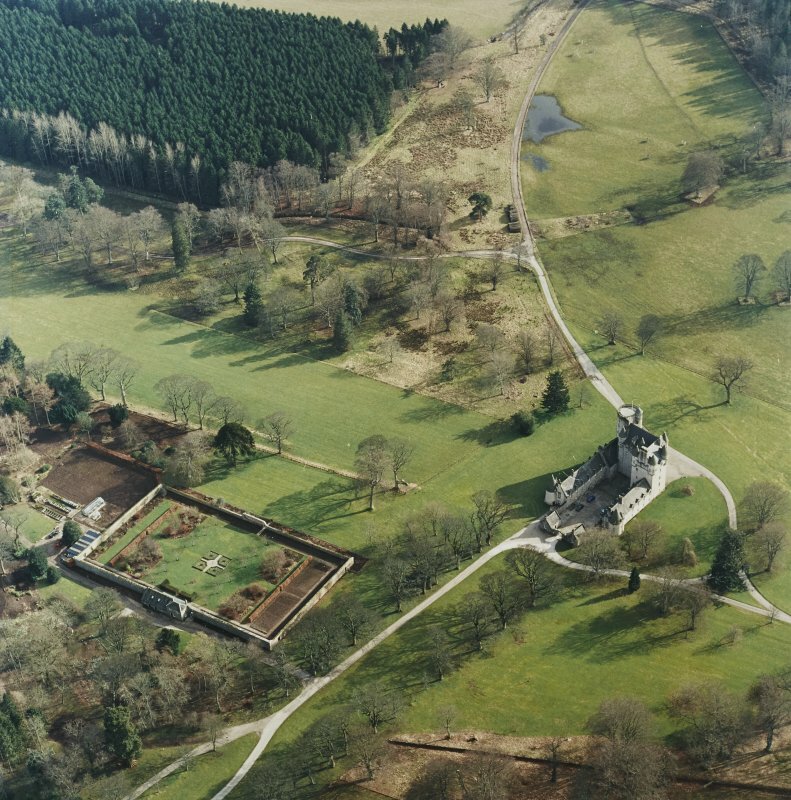 The present layout of the Walled Garden dates from about 1977-78 and is to a design by Eric Robson, former NTS Head of Gardens. 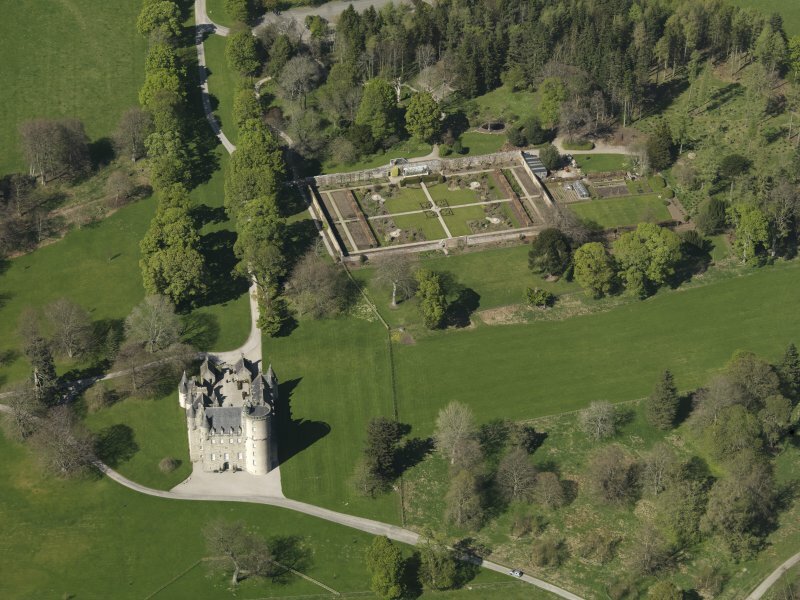 A west part, devoted to vegetables, and an east part, of lawn and mixed borders, are separated from the central square of the garden by purple beech hedges. An avenue of small trees, six in each row, aligns on the axis of the garden with mixed beds between the trees and hedge. A pump has been installed as the central feature in keeping with the earlier OS maps. One small glasshouse remains on the north wall with the bothy building on the outside of the wall. This is part 2-storey, part 1-storey, in rough squared granite blocks with some snecking: in use as public toilets and a gardener's room. The border to the south of the Walled Garden is also mixed shrubs and herbaceous plants. During the Smileys’ time, c.1959, this was planted to a design by James Russell of Sunningdale Nurseries using shrubs and strong-growing herbaceous plants, with some old-fashioned roses and room for a few lilies (see plan extract). By 1978 few of the original plants survived and the border was narrowed and replanted, again to plans by Eric Robson. 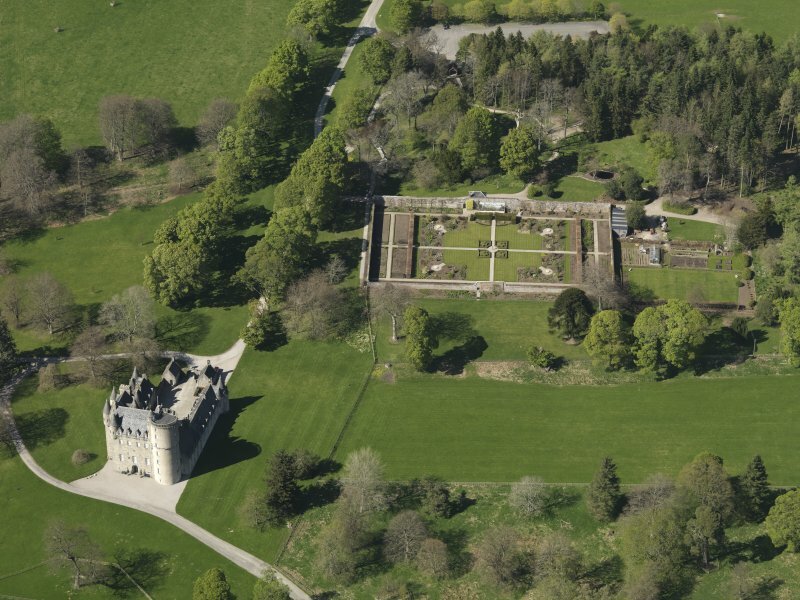 A watching brief was carried out on 20 April 2011 during works to establish a soakaway to the E of the walled garden. No archaeological features or finds were recorded.